SHATTERING DECEPTION OR ULTIMATE TRUTH? ?The man who saved Christianity? - grateful words spoken by millions after Dr. Jonathan Weber revealed the truth about an archaeological dig two years ago. But Jon isn?t interested in the hype. He's far more concerned with how people are being misled by prophecy enthusiasts and their bizarre end-times scenarios, particularly the wrong-headed predictions of his nemesis, Melvin Morris Merton. Still, Jon is a professor, not a crusader. He's happy with his life of teaching (Harvard and Hebrew University), writing (a best-selling ?biography? of Jesus), and research (Near East studies). He's also a newlywed, deeply in love with his brilliant and beautiful wife, Shannon. Not even an annoying lawsuit from Merton can shake his world. But Joshua Ben-Yosef can. This Israeli speaks a dozen languages - fluently and without accent. His words ripple with wisdom and authority, and crowds follow him, enthralled. He heals the sick, gives sight to the blind, casts out demons, and even raises the dead. Once again, Jon is drawn into a hot pursuit of the truth that at times casts him into the very lonely, very dangerous role of one man against the world. Review the evidence, join the dig near Nazareth that uncovers a first-century mosaic, and find out if three lines of Hebrew could change the course of history. 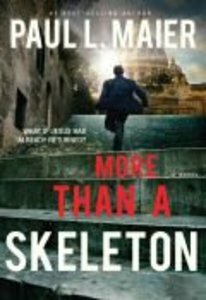 About "More Than a Skeleton (Abridged, 3 Cds)"
Paul L. Maier (M.A., Harvard; Ph.D., Basel) is the Russell H. Seibert Professor of Ancient History at Western Michigan University. In 1984 he was named "Professor of the Year" as one of America's twenty-five finest educators. His several million of his publications are print in sixteen languages including the award-winning Josephus: The Essential Works; Eusebius: The Church History; In the Fullness of Time; Pontius Pilate; The Flames of Rome, and The First Christmas: The True Yet Unfamiliar Story of Christ's Birth.